The young Chef Fabio Abbattista didn’t have an easy task acquiring this place from the most important Italian Chef worldwide Gualtiero Marchesi. But he did it very well. The exclusivity of the experience by eating here is totally safe. 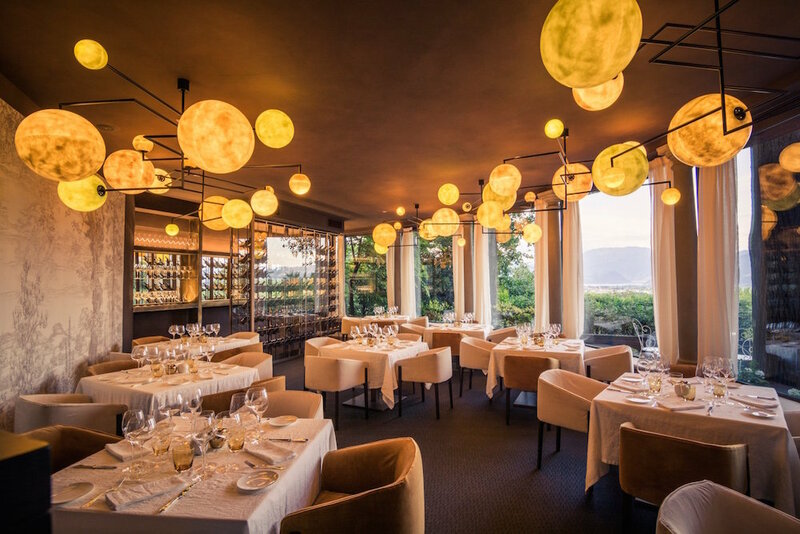 Surrounded by vineyards and charming as few, this Restaurant is part of the upscale property Relais et Chateaux l’Albereta. Inside the « Leonefelice » oozes glamour. A design you haven’t seen anywhere else made of perfect elegance and exclusive details. The wall filled with precious wine labels, the open kitchen, everything matches with the best (formal but flexible) service that Ermes with his incredible team will provide to you. Just inform him that you are vegan and he will discuss with the Chef couple of delicious proposals just for you. L’Albereta hosts the Henry Chenot health program and that’s why Chef Abbattista is very well prepared on this matter and will be able to create some tasty and together beautiful vegan dishes. I tried a gorgeous white asparagus smoked risotto and I actually sampled two desserts (pineapple ravioli and fruit sorbet). I basked myself in this food and beauty miracle.